If you are like the rest of us non-plumbers, then there is a good chance that you don't know which plumbing pipe is better. You may not even know what a PEX pipe is. Relax: Not many of us do. ,but maybe it's time that increase our basic knowledge so that we know what we are getting and whether it is something we truly want. Once you know the basics, you'll feel more comfortable to find a plumber to help you with your piping needs. Now you're probably wondering what PEX piping is. Well, it is cross-linked polyethylene pipe. After going through several processes, the material becomes durable for extreme temperatures (hot or cold), creep deformation which happens from long-term exposure to stress, and chemical attack from acids, alkalies and the like. All of this makes PEX an excellent piping substance for hot and cold water systems, especially since PEX is flexible and well adapted for temperatures below freezing all the way up to 200 degrees Fahrenheit. As mentioned above, PEX is a good plumbing material because it is flexible and easy for plumbers to install. 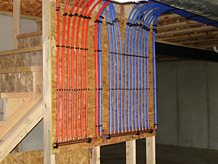 PEX is also resistant to breaks in cold weather and has fewer joints, bringing your costs down. Since copper piping has been around for decades, we know that the metal is durable and flexible, making it easy to install - especially compared to iron pipes. Copper piping alsoprovides a biostatic atmosphere, making it difficult for bacteria to grow inside of it, which is an important health consideration. Copper also resists corrosion and is unaffected by ultraviolet rays, which means it can be used for outside needs. This is unlike PEX pipes, which are affected by ultraviolet rays and therefore should not be used outside. 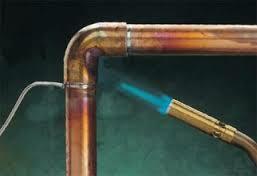 However, copper can corrode due to the pH of thewater if it is too acidic or too basic for the pipes. But just because it corrodes doesn't mean that the water is bad for you. Try to think of it like this: the Pacific Northwest region of the US and, of course, Canada, has some of the best drinking water in the world, but that very same water has a corrosive effect on the pipes. The choice between PEX and copper is solely yours, but keep in mind a few of the advantages and disadvantages of each system before you decide. We Asked Plumbers: What do you think about PEX piping when compared to copper piping? Carol Jones said: "It [PEX] is obviously superior, and easy to install. Copper will break, and then there are all the elbows that must be installed. Every spring, with copper, I have breaks from the cold winters. The polyethylene pipe (PEX) will give a little, so it'snot as likely to break as copper. And PEX is faster and easier to install and it is easier to drain the system since each line is independent to the incoming source of water. You can turn off each segment. Copper runs all together and is a lot harder to install sinceyou have to know how to solder, and not everyone knows how. With PEX, theonly thing you have to do is buy the expensive crimper, which pays off after having to have the copper fixed every spring because of breakage. PEX is more for do-it-yourselfers and it isn't hard to splice, plus it is cheaper to install."